“Back in the 1970s in a small company called Caterpillar. It was many of these tech innovations, which they pioneered, that are the foundational and fundamental basis of the futuristic vehicles we now see at auto and tech shows around the country, as well as right behind us in the parking lot here today,” said Illinois Autonomous Vehicles Association director Jerry Quandt on Thursday during a press conference just outside Guaranteed Rate Field. In that parking lot Thursday: trucks outfitted with technology like 360-degree cameras from Lisle-based Autobon AI that may one day allow for them to go down the highway without anyone in the driver’s seat. Also, a small electric car from Burr Ridge-based Innova EV. 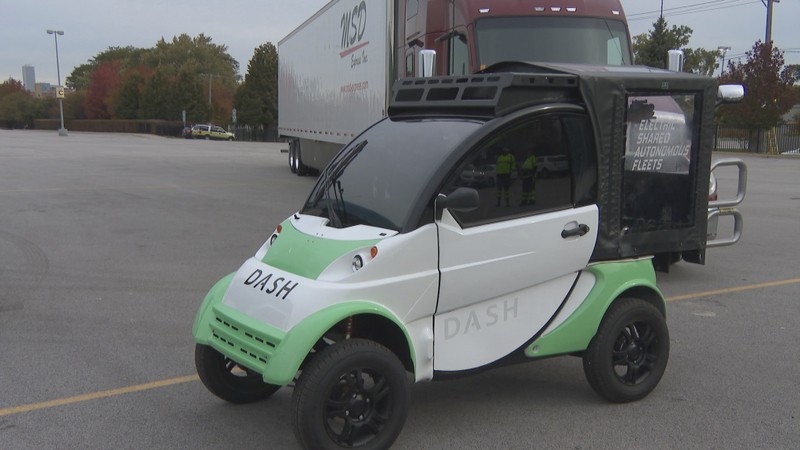 Seniors in Bronzeville can get short, low-cost rides to the doctor’s office or grocery store in a manual version of the Dash vehicle, but the company hopes to deploy the autonomous version once that’s legal in Illinois. “I see a time when vehicles, trucks and others will be completely self-driving. It’s not tomorrow but I think that is where we are going that is where the technology is headed. We gotta figure out the safety aspects of it, but I absolutely believes that’s where we are headed,” said Randy Blankenhorn, secretary of the Illinois Department of Transportation. Steps taken Thursday will begin to pave the way. Gov. Bruce Rauner signed an executive order with a two-fold purpose. First, it launches the Autonomous Illinois initiative, creating a division within IDOT to oversee the development of “connected and automated vehicle” (or CAV) technology. The order also creates a testing program in which the state will work with companies that want to (literally) get the show on the road by testing their products on state roadways. The program “will facilitate legal testing and programs on public roadways or highways in the state, where a licensed driver remains behind the wheel and able to take control of the vehicle at all times” the executive order reads. “Look at how we can move people and goods differently. If we connect and communicate those vehicles, what does that look like and the amount of vehicles we can on any given expressway or roadway – because it’s safer they can be closer together – how does that work? How do we deliver freight more efficiently? … That’s what, part of what, Autonomous Illinois is about, is how do we gather that? How do we learn from it? How do we make sure we’re creating something that works?” said Autobon AI co-founder Krystian Gebis. Illinois law currently forbids municipalities from regulating driverless cars, leaving the sole authority with the state; state statute does not allow such vehicles. “In Illinois the law is very simple: There has to be a driver behind the wheel. It doesn’t say that the driver has to be driving the car,” Blankenhorn said. There are a lot of fears and questions about going that route, but Blankenhorn said he believes it will make traveling safer, particularly considering how many distracted drivers are on the road. Trucking is a particularly dangerous occupation, said Gebis, whose company installs tracks with 360-degree cameras and GPS now but can also install radar, a thermal camera and electric-powered steering systems so that trucks could go along the highway on auto-pilot. Gebis said that’s when he predicts federal government regulations could allow it. He said there are other advantages of using the technology in the meantime: fuel efficiency and reducing costs. Illinois is working with universities to develop an autonomous freight test track in Rantoul, in central Illinois.